With Child mortality being labelled as a critical health issue as a result of malnutrition, lack of immunisation and access of mothers and children to medical services and health care, the first 1000 days of life became an important area for the Fund to focus on. 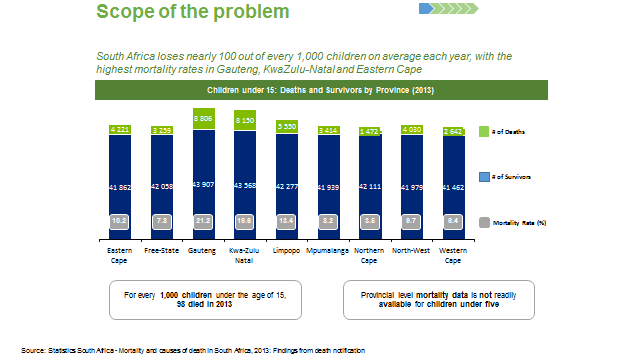 The Fund’s response is derived from an analysis of the scope of the problem, existing solutions and outstanding gaps. The purpose of this intervention is to make certain that the care system respond to the needs of children under the ages of 3 to better ensure their survival, development and thriving. The Fund’s role is to act with extreme vigilance in closing the gaps through Immunisation Coverage, HIV -AIDS Treatment or Prevention and tackling Malnutrition. 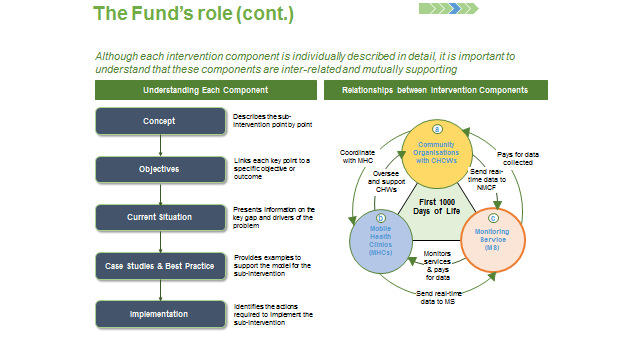 The Fund’s approach is about developing an activity based implementation plan considering the existing gaps at that level due to resource constraints. The plan is made up of three inter related components to address most of the gaps in the top five worst affected districts of O.R. Tambo, Alfred Nzo and Joe Gqabi in the Eastern Cape, Zululand in Kwazulu Natal and John Taolo in the Northern Cape. Community Health Workers (CHW) component is about overseeing and supporting CHWs, offering financial incentives, comprehensive training and opportunities for career progression in the field of primary health care. This initiative is introduced at household level to look beyond economic strengthening of families by integrating a health component within the sustainable livelihood. Focus of this component is community nutrition. Healthcare data is currently collected manually at the CHW level. The plan is to have in place an electronic data capturing to enable instant interventions to problems when they arise.